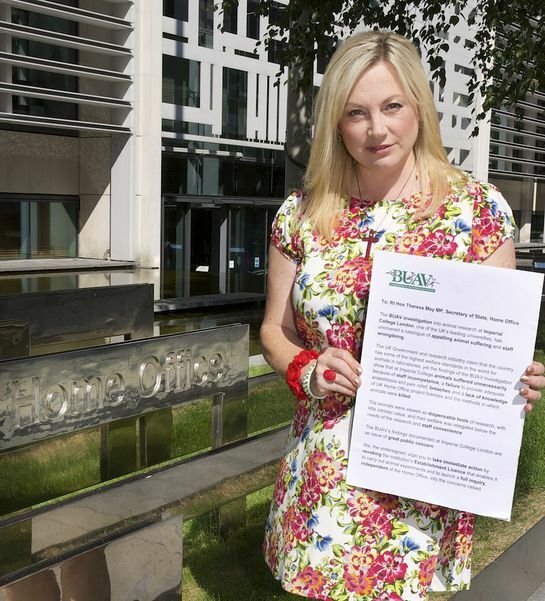 Television presenter and animal advocate, Wendy Turner-Webster, today joined the BUAV to hand in a petition addressed to Rt Hon Theresa May MP, Secretary of State. The petition, signed by over 65,000 people calls for an independent inquiry into disturbing evidence of animal suffering and poor practice uncovered by the BUAV during its investigation at Imperial College London, one of the UK’s leading universities. Others to support the BUAV call today are wildlife expert and television presenter, Chris Packham, and Bill Oddie, naturalist and TV presenter. Wendy Turner-Webster, Bill Oddie and Chris Packham join a number of other celebrities, who recently signed up to an open letter to Lord Taylor of Holbeach, Home Office Minister calling for an independent inquiry – including Joanna Lumley, Morrissey, Chrissie Hynde, Moby, Jenny Seagrove and Twiggy. The BUAV investigation documented a catalogue of shortcomings that caused even more suffering to animals than was allowed in the experiments. Findings included: breaches in and lack of knowledge of UK Home Office project licences; staff incompetence and neglect that resulted in animal suffering and distress; unsupervised researchers – with little experience – anaesthetising and carrying out surgery on animals; a failure to provide adequate anaesthesia and pain relief and the controversial use of a guillotine to carry out live decapitation.